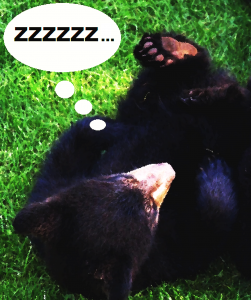 Bears hibernate; but we don’t. Maybe we should too. The bears have their reasons. Perhaps we should consider them and compare any we can think of for ourselves. So, here’s a chain of reasoning that suggests why—allowing what might be accomplished with a bit of genetic engineering or other forms of human cleverness—we might, with a little effort, be able and want to biotechnologically induce hibernation in ourselves, even if only to deal with chronic underemployment and unemployment. Let’s suppose that Joe has a job, but only because he has to, rather than having a fulfilling career with an earnestly and enthusiastically pursued mission and fulfillment. This means that he is putting in about 8 hours a day that he doesn’t enjoy so that he can have another eight of “free time” that he may enjoy—although generally not entirely, given the way things tend to go in our personal lives, e.g., having to deal with the likes of whining kids, nagging spouses, hunts for parking spaces and the dreaded parking tickets when we can’t find one. The remaining third block of 8-hours, usually reserved for sleep, is not intrinsically made possible by work; to the contrary—those 8 hours will be forced on Joe, work or no work, by Mother Nature, unless of course, he has to work even more than his normal 8 hours in order to afford a place to sleep away whatever time is left for sleep. Framed that way, it sounds like, at best, a break-even arrangement. Spend 8 hours doing something you dislike so you can have 8 hours doing something you do like. It can be, and often is, much worse: If he hates his full 8-hour shift, and has less than 8-hours of offsetting enjoyment or absence of off-putting stress in his free time, Joe is losing out. It’s as though he is using 200 calories to find and cook a potato that will yield only 100 calories. That’s like what a bear would experience if looking for berries or salmon just wasn’t worth the effort. The break-even-or-worse scenario is the sort that Karl Marx bemoaned when accusing capitalist employers of paying workers a bare subsistence wage—just enough to keep them alive and breeding their own replacements, and the kind of permanent, nightmarish estate that some underemployed Millennials may (have reason to) fear for themselves today, long since Marx entered his own permanent sleep. That dismal subsistence arrangement has generally been prevented for the past century-plus by the institution of the “weekend”, increases of worker productivity and the corresponding 5 or 6-day work week, which allows a better outcome than break-even-or worse, because of the additional free time as days off added to the weekly total. However, in a tough economy like the current one, there are a lot of Joes and Janes working 7 days a week or the equivalent by holding down more than one job with more than 8 hours per day in total spent working. As for Joe’s sleep, if he puts in 8 hours per day on slumber, it’s usually not disagreeable, although even more compulsory than work. That’s a very strange fact about sleep: It’s one of those few things in life that are, at least in minimal stints, absolutely compulsory, yet generally not at all unpleasant—much as breathing is, which is something that can’t be said for most jobs that are just jobs. Smarter to Sleep than Work? So, at the starting bell of round one, we can see that if work and sleep square off toe to toe, sleep has an edge, in terms of both appeal and rationality: it is usually enjoyable even though physiologically mandatory. It also has the edge in terms of flexibility: Most people without reserve material resources would not be able to get by if their full-time job were cut to part-time; yet many get by with part-time sleep—and not by sleeping more efficiently or “productively”, unlike part-timers who manage nicely with fewer work hours only because of a superior wage or drastically scaled-back needs. “But,” you say, “Joe has to work to feed himself—not just to ‘afford’ safe, sound sleep and finance fun. So, he’s coming out ahead by earning the calories and other resources he needs not only just to be able to work to earn the calories he needs just to be able to work, but also to earn the calories and money needed to have a safe place to sleep and to otherwise enjoy ‘the pursuit of happiness’ to whatever degree his job enables him to afford”. However, suppose Joe were to take a break from all of that break-even math, pause, and trade work for more sleep—in the form of literal hibernation as welcome sleep that can “knit the raveled sleeve of care” (as Shakespeare put it). In that case, he would need fewer calories and less money (which, in many respects, is a measure and equivalent of calories) to expend in work or in free time. The bulk of the calories expended would be expended doing nothing more than sleeping. Of course, that would require “fat reserves”—literal or figurative, e.g., in the form of post-dated checks handed over in pre-hibernation advance for the rent on the sleep den. The idea of induced hibernation as public policy is not as farfetched as it may seem, despite current obstacles and doubts: In 2006, after going missing, a 35-year-old Japanese mountain hiker was rescued, having survived for 24 days, in what amounted to a state of complete hibernation, e.g., body temperature of 71 degrees Fahrenheit, complete organ shutdown and minimal metabolic activity of any sort. If the mechanisms, environmental factors and genes that precipitated that state can be identified and controlled, it may become possible to induce hibernation in humans. Experiments, research and encouraging results with worms and mice in the last decade suggest that large controlled doses of hydrogen sulfide gas may hold the key to inducing suspended animation, and by extension hibernation in animals. Also, consider the states of suspended animation regarded as indispensable for interplanetary flight. That’s taken very seriously, as is research into it; so, why shouldn’t something like it not be considered for dealing with seasonal or cyclical unemployment and underemployment? That would make great sense for workers in fields ranging from working in actual fields as migratory purely seasonal workers as pop musicians, waiting for a retro-revival of their genres. That’s a rhythm that works for bears; hence, it might work for us. In his now classic dystopian novel, Brave New World, Aldous Huxley accustomed us to the idea of test-tube babies bred in vats, and modern cloning can be cited as a possible solution to population-and-labor shortages. Bears are genetically programmed for lights out in the winter, when their key food supplies drop below a critical level and when the calories expended to stay warm exceed those likely to be extracted from whatever food sources remain to be found during winter. Hummingbirds obey a comparable caloric imperative: Their small bodies radiate heat so quickly that the cold temperatures of winter would be unsurvivable. In fact, hummingbirds are known to hibernate on any given cold night, to reduce the caloric demands and heat loss they would otherwise face. Likewise, we could be programmed or otherwise scheduled to hibernate when some critical demand or reward for our labor falls below the break-even level of our comparable effort-reward interactions and hot-cold economy fluctuations. There is a good reason why, contrary to any expectation that I would do so, I won’t close this analysis with a conventional pun on “bear”, .e.g., “the bear facts” or “grin and bear it”—a predictable boring gambit favored by TV news reporters covering bear stories. It might make you yawn uncontrollably, sink into premature hibernation, lose your job and then wait for hibernation technology to make joblessness bearable.